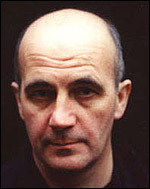 One of the most distinctive voices to emerge in British cinema since Peter Greenaway , Patrick Keiller was born in Blackpool in 1950. He studied at the Bartlett School of Architecture, University College London, and initially practised as an architect. Chris Marker's film La Jetée (France, 1962) left a deep impression, but he only made practical steps towards cinema in 1979, when he joined the Royal College of Art's Department of Environmental Media as a postgraduate student. Slide-tape presentations blending architectural photography with fictional narratives pointed the way towards his first acknowledged film, Stonebridge Park (1981), visually inspired by a railway bridge in an outer London suburb. Images from a hand-held camera are accompanied by a voice-over commentary presenting the thoughts of a petty criminal panicked by the consequences of robbing his former employer. Norwood (1983) continued the 'story', and the technique, in another London suburb. Short films of increasing technical sophistication climaxed in 1989 with The Clouds , a further topographical exploration combining another anxious fictional commentary with imagery derived from a journey across the north of England from Jodrell Bank to Whitby. None of these films stretched beyond twenty minutes. But any doubts about the limits of Keiller's idiosyncratic approach were obliterated by the feature-length London , an electrifying, slyly witty portrait of a city in decay, shot during 1992, and successfully premiered at the 1994 Berlin Film Festival . The essay format and audio-visual mix may superficially recall early Greenaway films, but the polemical punch and artistic strategies remain Keiller's own. Its success generated a sequel, Robinson in Space (1997), so similar in technique and spirit that for all the differences in emphasis and geography it seems as though we're watching the same film. Stylistically, these features extend the habits developed in Keiller's shorts. The visual material consists of static camera shots: images of urban decay and other socio-economic signifiers, road sign clutter, glowering skies - a landscape sharing some territory with the poetic realism of Humphrey Jennings and the Free Cinema film-makers, but framed and cut with a sharper, more avant-garde edge. Narrative input is chiefly found in the commentaries, spoken with quiet irony by Paul Scofield as an unseen friend of the equally unseen Robinson, a reclusive academic who undertakes research journeys into the 'problem' of London and England. Matters of architecture, French literature, fine art, Surrealism, photography, geography, history, sociology and economics all mingle in Robinson's analyses - aptly described in the London narration as 'exercises in psychic landscaping, drifting, and free association'. Both films explore and criticise Thatcher's Britain, but Robinson in Space pursues points more rigorously, advancing the contrast between prosperous new development and trade exports and the de-industrialised landscapes created by Thatcherite economics. Keiller returned to architecture as the subject for his third and most cogent feature, The Dilapidated Dwelling (2000), made for television but never broadcast, with Tilda Swinton as the voice of another researcher, surveying the dilapidated state of England's housing stock after a twenty-year absence. Conventional documentary elements are featured (archive footage, talking heads), but Keiller continues to press home his points with the kind of intellectual fibre, wit, and precision rarely given a chance to bloom in British cinema. In between film work, Keiller teaches, writes, undertakes his research, and works on gallery installations.